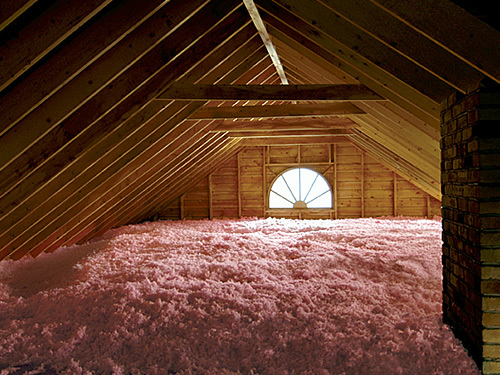 Attic insulation can be defined as a type of insulation that is used for any purpose. Insulation is normally used for thermal purposes, to help trap heat within the home to keep the home warm during colder seasons of the year. However, insulation can also be used for acoustic purposes, to help make the home soundproof, and can be used for impact purposes, which means that the roof will be able to withstand strong forces hitting the roof, like hail, for example. Insulation is always beneficial to the home owner, or those staying within that home. However, though insulation is extremely useful, there are cons to certain types of insulation. It is important to keep both the pros and the cons in mind while deciding to insulate your home. Cellulose insulation is made up of cellulose, which comes from recycled paper. Therefore, this form of insulation is friendly to the environment, and has better air sealing capacity than other forms. However, cellulose insulation provides more dust while being installed, and is more expensive than other forms of insulation. Furthermore, it is heavy, making it difficult to install in certain areas of the house. Cellulose insulation can cause an allergic reaction, especially because of certain chemicals that are used during the recycling process. Finally, cellulose insulation is made of paper, which means that it will absorb moisture very quickly, reducing its efficiency and its lifespan. Spray foam insulation is considered to be the best in terms of air sealing capacity. However, spray foam should be done in moderate amounts. This is because too much foam can cause poor air circulation in the attic, and too little foam can result in air passing through random spaces in the attic, causing a draft. This spray foam is extremely light in weight, making it easy to install. However, because of its light weight, the foam can stick to substances, so it is important to be careful and protected while your attic is being insulated with spray foam. Finally, the cost of spray foam is exceedingly high, making it difficult to afford. Fiberglass insulation is a form of insulation which uses a host of materials, and is easy to install and maintain. Furthermore, fiberglass insulation is easily available and affordable, making it a useful option for many. However, the materials used in fiberglass tends to pave a certain passage for air – which can be inconvenient when installing fiberglass insulation to your roof. Furthermore, fiberglass comes in limited sizes, making it difficult to insulate specific areas of your home. Jerry’s Insulating Co. is a family owned company that was established in 1975. With over forty years of professional and industrial experience, you can be sure that you will be provided with the best of material and resources with which you can insulate your home, and will be able to work with competent, trained installers who would gladly aid you in your home projects. Furthermore, you will be able to ask for professional advice and guidance on how to maintain the insulation to ensure that it lasts for as long as possible. These services are priced at market rates, making them useful and affordable.